Inel Gas Controls Pvt Ltd ( IGCPL) was started with the vision of serving the Gas utility in India and abroad. Started Operation in December' 2006 from Savali factory we have served to Gas utility across India. Our expertise is filtration, Pressure regulating, Metering of domestic, commercial & Industrial customers as well as GSM / GPRS based AMR and remote monitoring systems. 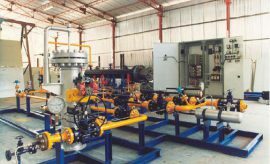 Leading solutionizer for Natural Gas Metering, Pressure regulating, GSM / GPRS based Automatic Meter Reading and remote monitoring systems. Inel Gas is a team of young and dynamic engineers working continuously towards bringing the new technology as per their vision in CGD industries. Smart Metering in the area of domestic and commercial customers with the latest technology is further enhancing our vision of the company. Smart Metering – MeterSit, Italy.